In an historic council meeting, Mr Smith served alongside new General Manager Lisa Miscamble who officially starts her term on Thursday. 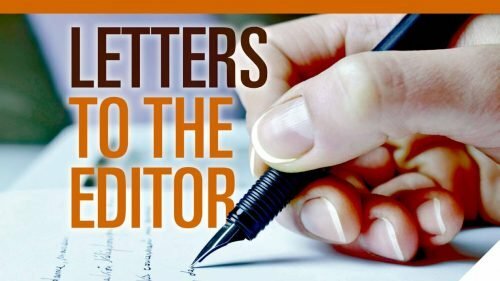 Emeritus Mayors Sue Hoopmann OAM and Richard Quinn said Mr Smith had ensured the survival of the heritage municipality during the last year’s battle against a proposed state government forced merger. “During the forced merger Barry Smith risked his standing and none of us would be here tonight without his support,” Richard Quinn said. Sue Hoopmann OAM said Mr Smith had restored community confidence in Hunters Hill Council at a time of crisis. “When Barry arrived 22 years ago the community was still reeling about the loss of a previous general manager,” she said. “Gradually, Barry won over the residents and Barry’s networking was invaluable and still is. 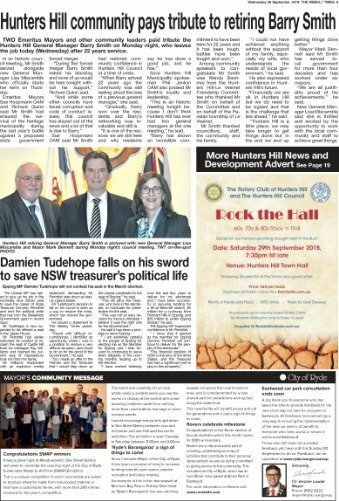 Save Hunters Hill Municipality spokesman Phil Jenkyn OAM also praised Mr Smith’s loyalty and leadership. “This is an historic meeting tonight because I don’t think Hunters Hill has ever had two general managers at the one meeting,” he said. Among community speakers to congratulate Mr Smith was Wendy Benrimoj from the Hunters Hill-Le Vesinet Friendship Committee who thanked Mr Smith on behalf of the Committee and on behalf of the Parisian township of Le Vesinet. Mr Smith thanked councillors, staff, the community and his family. “I could not have achieved anything without the support of my family, especially my wife, who understands the needs of local government,” he said. He also expressed confidence in Hunters Hill’s future. “Financially we are ok in Hunters Hill but we do need to be vigilant and that is the challenge that lies ahead,” he said. Mayor Mark Bennett said Mr Smith has served local government for more than four decades and has worked under six mayors. “We are all justifiably proud of his achievements,” he said. New General Manager Lisa Miscamble said she is thrilled and excited by the opportunity to work with the local community and staff to achieve great things.